Providing you the best range of frp bottle design induced draft cooling towers, frp packaged cooling tower, heavy industrial cooling towers, cross flow cooling towers, fanless colling tower and jet cooling tower with effective & timely delivery. 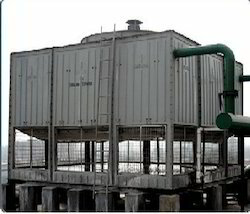 We are offering FRP Package Cooling Tower to our clients. Our Heavy Industrial Cooling Towers are manufactured in best quality standard to meet the international quality standard. Oceanic Cooling Towers is one of the leading companies engaged in production and supply of wooden cooling towers, dry cooling towers, and portable cooling towers. Designed for dependability, operational simplicity and durability, these Wooden Cooling Towers and FRP Cooling Towers cater to the ever-increasing demands for power generation in various process industries. These are designed to provide a more wet surface area for uniform water distribution and improved heat transfer rate. 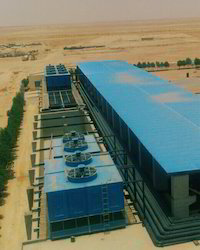 Our cooling tower is designed from the latest technology and from quality raw material so that it can be used in the heavy environment also. 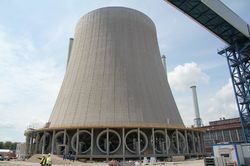 the cooling tower is a heat rejection device, which extracts waste heat to the atmosphere through the cooling of a water stream to a lower temperature. 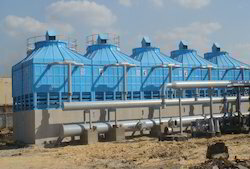 Cross Flow Cooling Towers type of heat rejection in a cooling tower is termed "evaporative" in that it allows a small portion of the water being cooled to evaporate into a moving air stream to provide significant cooling to the rest of that water stream. The heat from the water stream transferred to the air stream raises the air's temperature and its relative humidity to 100%, and this air is discharged to the atmosphere. Designed for dependability, operational simplicity and durability, these Fanless Colling Tower cater to the ever increasing demands for power generation in various process industries. The construction of these wood cooling towers includes treated timber that has the ability to resist the adverse effects of contaminated water from the process industries. Jet Cooling Systems offered come designed and developed using latest technology support and makes use of working principle involving evaporating air using water to absorb heat from air for bringing down of temperature. 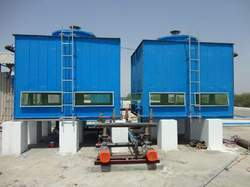 Further, the system provides support for both cooling and ventilation with the cooling effect achieved depending upon outside air temperature and relative humidity. Some of its benefits include provide for reliable functional usage; featuring inverter controller which assures of minimum power consumption among others. 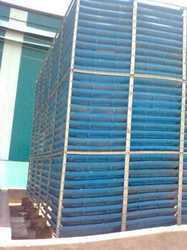 Bottle Shaped Cooling Towers are also known as FRP induced draft cooling tower, we manufactured this product from best quality material so that we make available bottle shaped design cooling towers at a very reasonable price. These are qualitative, long-lasting and also available in various specifications. Forced Draft Cooling Tower offeredcome designed and developed using latest technology support and feature ABS material based air drum as well as stainless steel body finish so as to provide for lasting performance. Further, these draft cooling towers also come with advanced water sprinkling system so as to provide for uniform water sprinkling support. Some of its features include quality finished water dissipation tube for minimized obstruction, advanced heat exchange support, superior pump cover for lasting durability, suitability for use in areas like cooling special fluids, compressor jacket cooling, machine jacket cooling, induction furnaces, closed circuit cooling and others. It has a rustproof tough FRP bottle type design, which can withstand high wind velocity and vibrations. This model does not require any painting and is compact in design with long life. Comes with a honeycomb designed rigid PVC, which has extended surface area. It assists in splitting air and water, which in turn enhances the contact time and heat transfer area through evaporation. Our PVC modules are vacuum formed and comes with double edges, to provide highly efficient and robust packing. These modules are the heart of the cooling tower. The fan of the module is aerodynamically designed & has adjustable blade type axial. The flow fan is highly efficient & ensures large air flow at low static pressure with low noise levels. The motor used is a squirrel-cage TEFC induction motor, which comes with an IP55 weatherproof electric motor that is suitable for humid outdoor conditions. 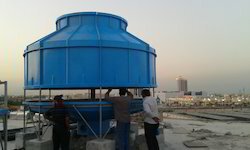 Compact Draft Cooling Tower induced type, offered by Oceanic Cooling Towers Private Limited is known for superior design and technology. 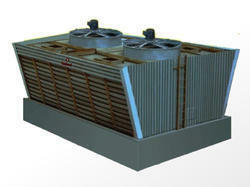 The cooling towers are designed to meet the high standard of performance demanded by engineers. These FRP induced draft cooling towers deliver compact, heavy duty and efficient cooling function and have an aesthetic design. Empowered by a technologically-advanced manufacturing facility, we manufacture, export and supply a premium quality range of FRP Cuboid Cooling Tower. 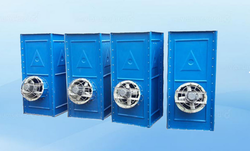 It is expansively used for cooling purposes in various engineering industries. Our offered tower is assembled at our technologically advanced manufacturing unit under the direction of our experienced professionals using superior grade components and sophisticated technology. 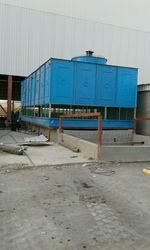 Thoroughly tested on several parameters of quality, this Frp Cuboid Cooling Tower can be owned from us in different specifications. Bottle Design Cooling Towers has rust proof tough FRP bottle type design, which can withstand high wind velocity and vibrations. This model does not require any painting and is compact in design with long life. We used best in the best raw material to deliver product in quality. 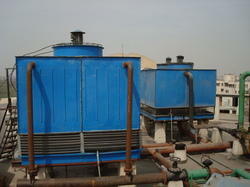 The FRP Cooling Towers we offer have fixed targeted nozzles in the hot water basin. They are designed meticulously for water distribution and are highly resistant to temperature and weathering. All specification for this model is the same as that of round bottle shaped cooling tower, although the sprinkler is replaced by nozzles in this model. These fixed targeted nozzles are used in the hot water basin. They are specifically designed to deliver the required water distribution and are highly resistant against temperature and weathering damage. The use of target nozzles also eliminates the requirement for separate diffusion deck, which is otherwise required to provide complete water distribution throughout the fill area. These nozzles operate under gravity with utmost precision. We used best in the best raw material to deliver product in quality. 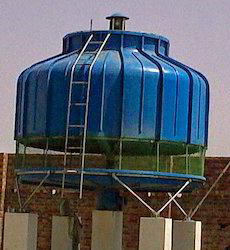 The Round Shaped FRP Cooling Towers we offer have fixed targeted nozzles in the hot water basin. They are designed meticulously for water distribution and are highly resistant to temperature and weathering. This cuboid shaped FRP cooling towers, advanced cooling tower, and cuboid cooling tower are preferred for minimum drift losses, easy accessibility of internal components, high thermodynamic efficiency and low power requirements. We used best in the best raw material to deliver product in quality. 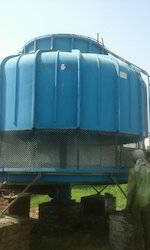 The Square Shaped FRP Cooling Towers we offer have fixed targeted nozzles in the hot water basin. They are designed meticulously for water distribution and are highly resistant to temperature and weathering. The use of targeted nozzles eliminates the need for separate diffusion deck. FRP Packaged Tower is most in demand by our satisfied customers. 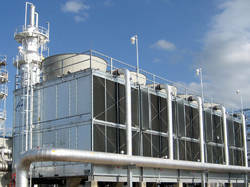 Cooling towers are also characterized by the means by which air is moved. 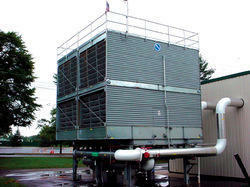 Mechanical-draft cooling towers rely on power-driven fans to draw or force the air through the tower. Natural-draft cooling towers use the buoyancy of the exhaust air rising in a tall chimney to provide the draft. 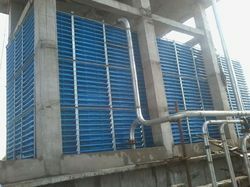 A fan-assisted natural-draft cooling tower employs a mechanical draft to augment the buoyancy effect. Many early cooling towers relied only on the prevailing wind to generate the draft of air. We always upgrade our manufacturing technology to meet the present changing scenario. 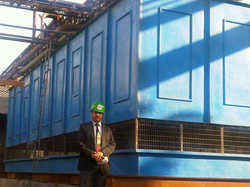 Wooden Cross Flow Design Cooling Towers are designed to meet present requirement of our prominent customers. 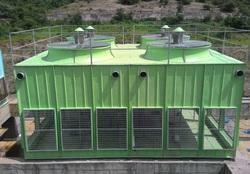 These cooling towers are manufactured from quality material so that it can be used in heavy environment also. Our wooden cooling tower is widely used by our satisfied customers the construction of these wooden cooling towers includes treated timber that has the ability to resist the adverse effects of contaminated water from the process industries. We have designed for dependability, operational simplicity and durability, these Single Flow Wooden Cooling Towers and dry cooling towers cater to the ever-increasing demands for power generation in various process industries. 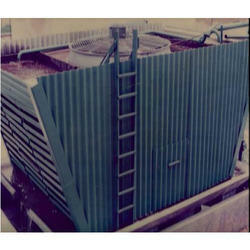 We are the manufacturer of FRP Square Cooling Tower. 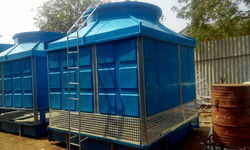 We manufacture finest quality of Natural Draft Cooling Tower. We understand the various requirements of this industry and thus better equipped to face the competition. The company works with a customer-focused approach and every care is taken to ensure maximum customer satisfaction. 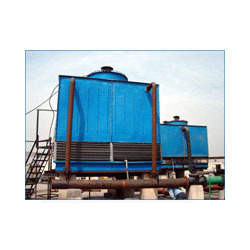 FRP Cooling Towers offered come designed and developed using latest technology support and find application in cooling of equipment in the manufacturing industry sector. Providing for consistent and smooth performance, these cooling tower designs are based on achieving higher energy-efficiency as well as offer practical support for cooling-heat exchanging. Designed for dependability, operational simplicity and durability, these Crossflow FRP Cooling Towers cater to the ever-increasing demands for power generation in various process industries. We are the manufactures of Timber Type Cooling Tower also known as Timber Wooden Cooling Tower this type of cooling device is constructed with chemically treated wood. The wood structure tower is designed with counter/cross flow design, suitable for industrial use in steel mills, Petrochemical mills etc. 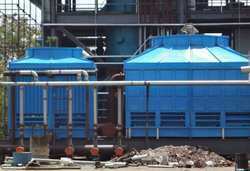 These Cooling Towers are supplied with treated timber construction.